Never a day goes by that isn't filled with necessary things. Today brimmed with busyness (how can it not when you have five children?) and we had to run to keep up. Maid Elizabeth is finishing her advanced EMS course and she and another student needed a few more I.V. starts in order to qualify to take the test. We offered our veins to science and so we spent our teatime having needles inserted into our arms. In anticipation of our working afternoon, Maid Elizabeth and I prepared tea treats and dinner early in the day. Madeleines (a delectable French cake/cookie) were the chosen delicacy to accompany our afternoon tea. They are light and buttery and altogether wonderful. They are a specialty of Maid Elizabeth and a favorite of Sir Knight's. She mixed them up late in the morning and allowed them to sit in the refrigerator until she was ready to bake them. They turned out perfectly! As we sat with tourniquets on our arms sipping tea, we nibbled on rich, warm Madeleines, lightly dusted with confectioners sugar. Perfect. Melt butter and allow it to cool while you make the batter. In a small bowl, place the flour, baking powder and salt and whisk until well blended. Beat eggs and sugar until mixture has tripled in volume and forms a thick ribbon when the beaters are lifted (about 5 minutes). Add the vanilla extract and beat to combine. Sift a small amount of flour over the egg mixture and using a large rubber spatula, fold the flour mixture into the beaten eggs to lighten it. Sift the rest of the flour over egg mixture and fold in, being sure not to overmix the batter or it will deflate. Whisk a small amount of the egg mixture into the melted butter to lighten it. Then fold in the cooled, melted butter in three additions. Cover and refrigerate for at least 30 minutes or several hours, until slightly firm. Position rack in the center of the oven and preheat to 375°. Generously butter two 12 mold madeleine pans. Dust the mold with flour and tap out the excess. Drop a generous tablespoonful of the batter into the center of each prepared mold, leaving the batter mounded in the center. Bake the Madeleines for 11 to 13 minutes, until the edges are golden brown and the centers spring back when lightly touched. Do not overbake these cookies or they will be dry. Remove the pans from the oven and rap each pan sharply against a countertop to release the Madeleines. Transfer smooth side down on wire racks to cool. Dust with confectioners sugar to serve. 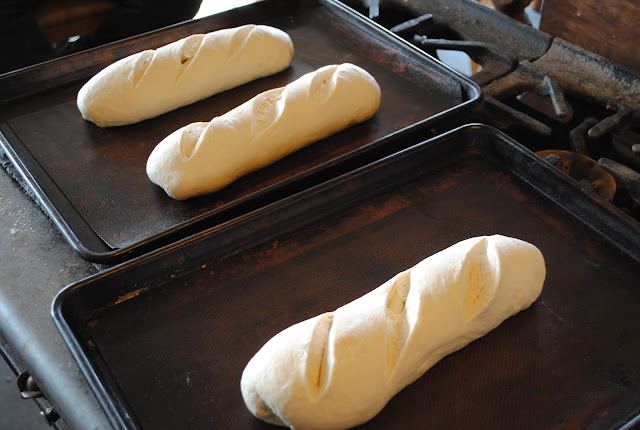 After tea and an I.V., we sent our guests home with fresh, warm loaves of French Bread and began dinner preparations. Pasta is one of our favorite summertime meals. We especially love homemade pasta smothered in olive oil and garlic with plenty of vegetables thrown in for good measure. My best high school girlfriend invited us to dinner years ago, and treated us to the most incredible pasta dinner we had ever enjoyed. She is an American, who married an Australian, who was originally from Italy. Jen spent summers with her husband's family, in Italy, cooking with his grandmother and eating Gelato. She made a vegetable sauce that was to die for and a balsamic vinaigrette that was absolutely unparalleled. Sir Knight and I adapted her sauce to our own tastes and now it has become our family's favorite. Saute chicken in olive oil on medium/high heat. Add a dash of chicken bouillon. Add garlic, saute. When chicken is sufficiently cooked, add onions (1 whole), green pepper (1 whole) and tomatoes (use fresh or 2 cans of Italian tomatoes, including the water). Add olive oil to almost cover the veggies. Simmer until vegetables begin to get tender. Add Italian Seasoning and salt and pepper to taste. Serve over fresh, hot pasta. Pour the flour and salt into a mound on a kneading surface or board. Make a well in the center and break the eggs into it. Gradually draw the flour into the eggs with a fork and beat lightly. You can add olive oil at this point. Continue until the flour has absorbed all the egg. Work in a little additional flour if the mixture is exceptionally moist, but don't overdo it. If you are not sure about the amount of flour to add, push your finger into the ball of dough as far as its center. When you pull it out, it should feel somewhat sticky, but not moist. If it feels moist, work in a little more flour. Let the dough rest for a few minutes to give the flour a chance to absorb the liquid. Cover the dough with a damp towel and let it rest for at least 10 minutes but up to 30 minutes. Lightly dust the pasta with with your hands and flatten it out with your hands. Put in your pasta machine and flatten and knead until the dough takes on the consistency of suede. At this point you can begin to adjust your machine one notch at a time until you have the right thickness for the pasta you are making. Cut, boil and serve. Because we like this sauce so well, we actually plant a garden and can produce in accordance with Jen's recipe. Every fall, we harvest (or buy, if our garden has failed) pounds of tomatoes, onions and green peppers. We dice them all into bite sized pieces, mix them together and pressure can the mixture in quart jars. We use this tomato, onion and pepper mixture for everything from pasta sauce to a soup base to salsa. It is so incredibly versatile that we would hate to be without it. We don't add any spices before canning so that we can tailor it to whatever we happen to be making. Italian spices go into the pasta sauce, Mexican spices go into salsa and so on. And now we close an eventful day, tummies full of good food and arms full of needle pricks. What a fulfilling life we live. I saw a great summer time pasta recipe the other day. You take a cooked lasagna noodle and put sliced vegetables on it, such as: radishes, cucumbers, onions, avocados, julienne carrots, spinach leaves, cilantro, and drizzle your favorite dressing on it. Roll it up and serve. It looks really yummy and refreshing. Thank you for sharing your recipes. Train as you will fight... Consider wearing gloves while working with 'sharps.' In a formal medical environment, wearing gloves will be a requirement. Believe me, the 'feel' is different. Being 'old-school' I learned bare-handed, and never had a problem with working around sharps, but I never stuck myself so many times as I did after the requirement to wear gloves went into effect. Love you guys! You are right, of course. Generally, we always use gloves while working with any blood borne pathogens. Why the ladies didn't this time, I'm not sure. In class, they don't turn around without their gloves or other personal protection equipment. Thanks for the reminder. I still have not tried my pasta machine...sigh. I really need to. I love your recipes. I just bought a pressure canner this spring. I would love to have your tomato-pepper-onion recipe. Yes, I second the request for your tomato-pepper-onion canning recipe. I LOVE it when you blog about recipes!!! Ok......... I wanna move the family to your back yard. I'll build my own shack er hootch. I'll tend my own chickens and goats. I'll split my own wood and the rest of lifes chores. Ya just gotta have an open house once every few weeks though............. Thomas T. Tinker. Those guest do have good veins. Boy you want practice, try my arms. I hate to go give blood as I have to be stabbed at least three times before the blood flows. It's not the part of being stabbed, it's the part of watching the gals faces when they have to try again.